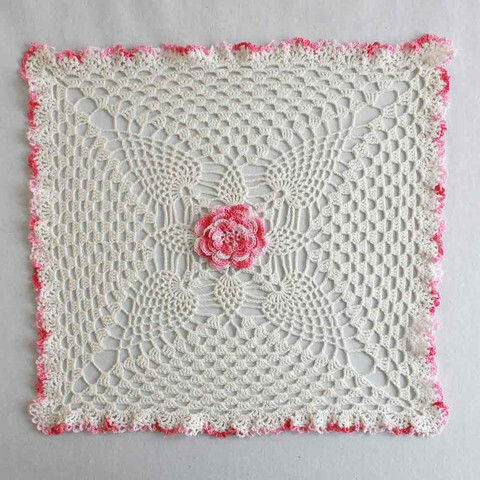 Doilies are decorative mats that are usually made of paper or fabric. They have been used to protect surfaces, bind flowers, and showcase sweets and cakes… But have you ever considered doilies for clothing? 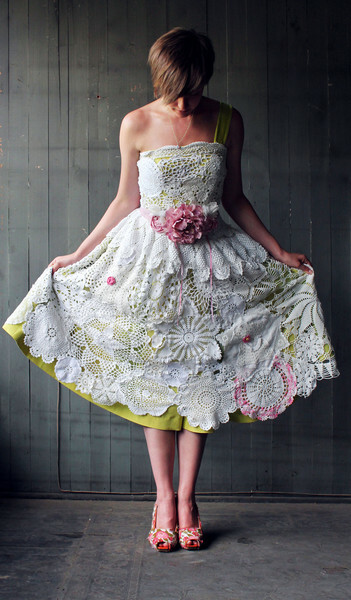 Check out these astounding doily dresses! This Lela Rose: Lace and Satin Shift Dress can be found on Net-a-Porter. Although it is not available anymore, this dress has a beautiful black satin underlay that flatters the ivory lace doilies. 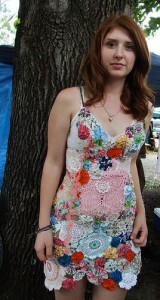 This dress is a colorful beauty made from fabric remnants and doilies. 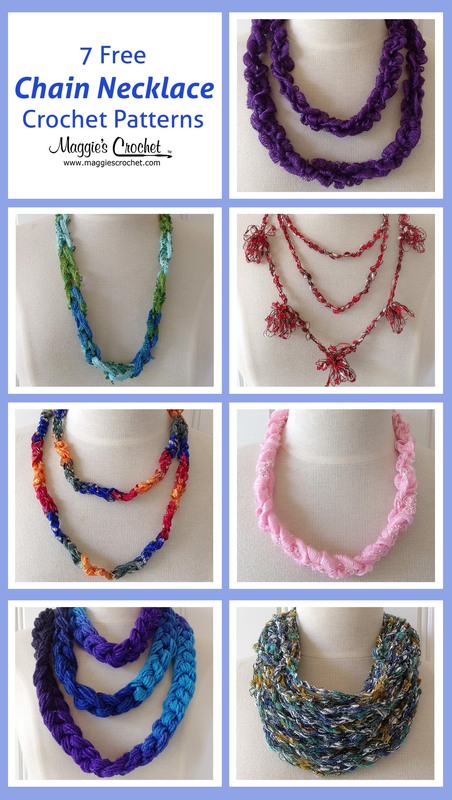 It can be found on Crochet Concupiscence. This prom dress was made by Janelle Ponte of Pontepretties Specialty Crochet and crafted using Aunt Lydia’s Crochet Thread. 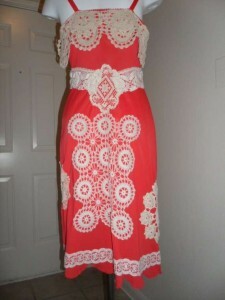 This is a one-of-a-kind beautiful orange colored dress embellished with doilies that was in Kathy’s Etsy store 1ofaKindsByKatDesigns. Using left over doilies and lilac organza fabric, Holly made this beautiful dress for herself. You can follow the instructions on her blog Holly Made. This is an absolutely stunning short doily wedding dress made by Garage 34: an Indie Handmade Shop. 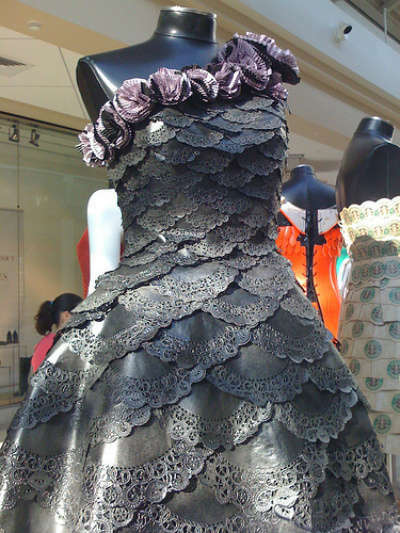 Would you believe this dress is made from paper doilies? Who wouldn’t feel like royalty in this elegant dress from Stealfinder? This chic black dress that is adorned with vintage doilies can be found in Etsy’s BaysideBoutique. It has a really unique layout that uses different designed and sized doilies. The entire dress doesn’t have to be made of doilies. Sometimes a single doily on a simple dress can add just enough pizazz like this dress from Etsy’s Jiorji where a large oval doily was added to the front. There are so many doily dresses that you can find online and in stores. Have you ever made or embellished a dress using doilies? If you are interested, start by making your own crochet doilies. 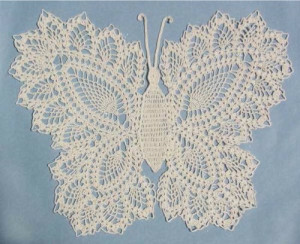 Patterns for the doilies below are available at Maggie’s Crochet. Click the images for the pattern information. 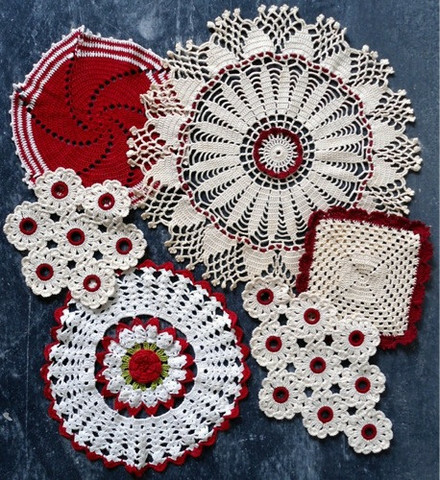 The possibilities are endless with these vintage doilies. What will you create? This square pineapple and rose granny square doily could be the foundation to a really unique doily dress. 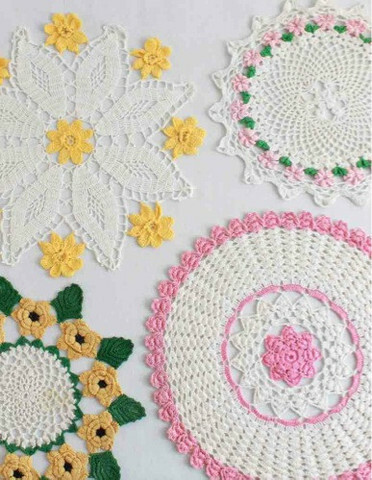 These vintage floral doilies would be so awesome on a doily dress! Wouldn’t this doily look awesome on the front of a dress or shirt? Check out other doily crochet patterns for your doily dress and get started. We can’t wait to see what you make!